News overnight of a further $96,000 price drop on the 29m motor yacht Serenity II from Chris Chumley at Northrop & Johnson. A capable offshore motor yacht Serenity II was built in 1990 by Admiral Marine to a Jack Sarin design and has spaces and features more typical of a larger yacht. Accommodating six guests in three cabins, including a main-deck master suite, the yacht also has comfortable crew quarters for five. Serenity II comes equipped with economical twin Caterpillar 3406 engines giving a top speed of 14 knots, a cruising speed of 10 knots and a range of 5,000 nautical miles. 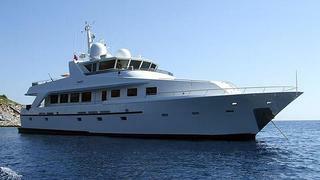 Lying in Fort Lauderdale, Serenity II is now down from $1,595,000 to $1,499,000.